How can I make applications on OSX open new windows in the same space when opening a file from Finder? OSX 10.8. Pretty simple. Right now when I open a file through Finder, if the filetype is set to be open by application Y, oftentimes OSX finds a space that has an open window of Y, and sends the file into that window in that space. What I want though is, when I open the file, I want a new window for that file, and in the same space. Per this question, I know that there is a workaround explicitly for Chrome, which is great; ditto this for Finder. But I want this setting to be system-wide. E.g. I want to open a new txt document through finder and have MacVim open a new window with the file in my current space (as it would if it were launching for the first time) rather than locating an open window in a separate space and pulling the file into a tab in that window. Note, I do have my settings set so that switching to an application does not switch to a space with an open window for that application, which works correctly, but when the application launch takes place through a file opening rather than via the cmd-tab switcher, it still does the find-an-open-window-even-if-in-another-space thing. --and I don't see how you can solve one without solving the other; but it'd be great if either or both could be solved. 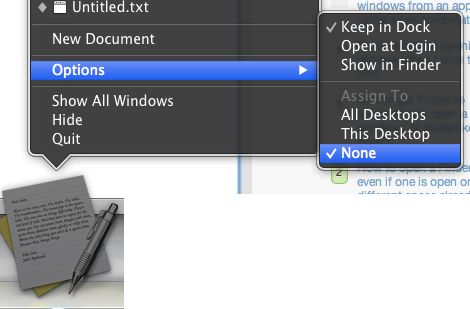 Does setting the assign to Desktop:none; work for you. You can do this from the Applications Dock menu. for some application this will not work, because some apps like TextMate open new documents in a new tab, but I’m pretty sure these apps have own options to prevent this! I think I finally got a fix, for Microsoft Word (and presumably other Office apps too): Make sure you have a Word window open in all workspaces... of course, you can make the window really, really tiny and pushed away into a corner. This also helps with the jump to another workspace with an open window when you close "the last" (actually useful) window on a workspace. This is on Mavericks. A fully minimised (docked) window doesn't seem to do the job, though. Not the answer you're looking for? Browse other questions tagged macos applications finder window-manager spaces . How can I stop Spaces from taking me to an app's Space when I open a new file? How do I bind a key in OSX to open a new window of an application? How to open a Finder window even if one is open on a different space already, in Terminal? How can I automatically focus Finder windows after CMD-TAB to one in a different space? How to open new Finder window in current space quickly? How to open a Finder from anywhere?